While we've always had an interest in skincare, being in our mid twenties has really made us take a look at what we're using on our skin. Now that Glasgow has it's very own Kiehl's store right on the main shopping street, we gladly accepted the invitation to visit the store and learn all about skincare, the Kiehl's philosophy and the amazing charity work going on at the moment. We joined our fellow Scottish bloggers for a intimate event to learn about the MTV Staying Alive Foundation, which helps to prevent HIV. As Kiehl's doesn't advertise, the collaboration with MTV is essential in getting the message across. While we have spoke about the campaign previously, this year is a little different. This time it's being headed by Laura Mvula and for each limited edition Ultra Facial Cream sold, Kiehl's will give £10 to support projects around the world. Last year this was £2 per pot so there's been a huge increase in the amount going to support these projects. The Buchanan Street team have also been taking part in charity work closer to home, with their recent 5k run to raise funds for the Glasgow Children’s Hospital Charity. Another new thing is their Recycle and Reward program. Each time you bring back an empty pot, you'll receive one stamp which contributes towards freebies such as: 3 stamps = a lip balm, 5 more stamps = a 250ml product and 5 more stamps = a 250ml product so if you're a fan of Kiehl's you may as well reward yourself for it! 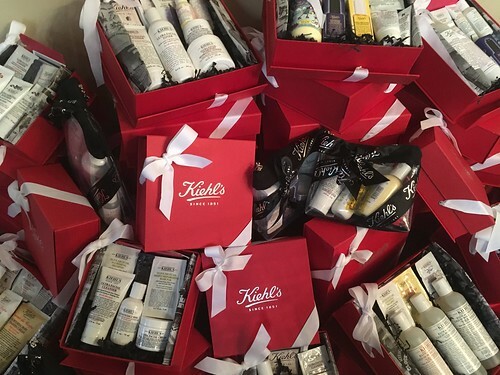 While we're quite familiar with the Ultra Facial Cream and Creme de Corps, one part of the event we loved was hearing recommendations from the Kiehl's staff. Did you know they have to study and sit exams before they start working for Kiehl's? It really shows the commitment of the brand to inform their staff and it was really refreshing to hear people know so much about their products. One product that was raved about the most was the Iris Extract Activating Essence Treatment which is definitely on our wishlists from now on. After all the skincare chat we enjoyed a little food break from Halloumi, a greek restaurant in Glasgow, which was a really lovely treat. We headed back home, armed with our new skincare additions and you better believe we gave ourselves a little pamper in the evening! Big thanks to Kiehl's for such a lovely, informative event. If you'd like to donate to the MTV Staying Alive foundation you can make a one off payment here or text KIEH98 followed by £1, £2, £5 or £10 to 70070.